The piecing is complete. Part 1 and Part 2. 1. Piecing completed. Ready for quilting. Trim foundation fabric to 1" extra. Trim the excess foundation fabric(s) to 1″ larger than top. Now its time to quilt! First step. Build a sandwich. The bottom layer is the backing fabric – ironed nicely and laid down right side DOWN. Some quilters use tape to keep the backing flat and tight. Next layer is the “filling”. I like to use either flannel or linen. As my projects have a Destashification Goal, for this project I used a green linen I had several yards of in The Stash – also ironed nicely. 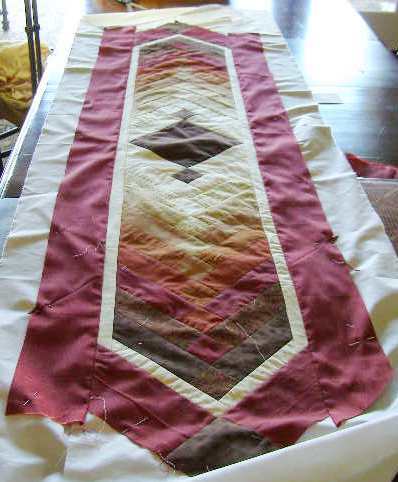 The top layer is the pieced runner top. Pin the center square of the top through all layers. 2. "Stitch-in-the-Ditch" follow the arrows. Using your hands, smooth the top, moving from the center square towards the ends, pinning as you go. Safety pins are a wonderful option here. Saves the hands when sewing! Pins should be placed in every other square in the design and then in every other strip. Pins should also be placed approx. every 6 inches in both the narrow and wide borders. Yes, that is a lot of pins. But the end result is worth it! There are numerous options for quilting. Hand quilting. Long arm quilting. Choose one that works for you. Photo 2 illustrates one option for quilting. 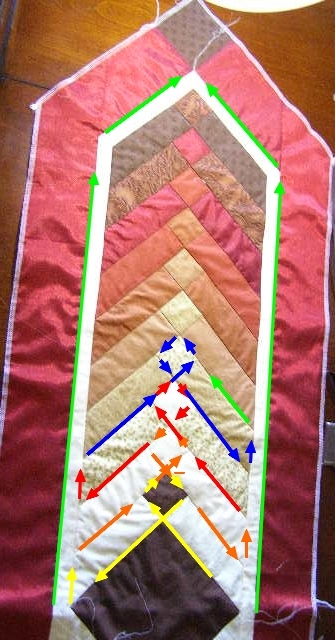 Continuing the quilting pattern shown by the arrows will quilt half the pieced design without having to stop and start in another location. Then quilt the seam between the inner and outer borders – starting at the center square and sewing towards the end points. Repeat the quilting on the other side of the top. 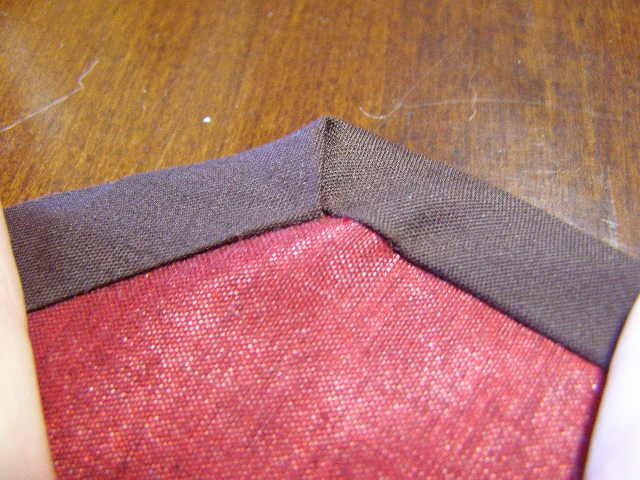 I then finish the sandwich edges with a serger (shown in Photo 2 – I forgot to take pictures before I serged). However, a serger is not necessary. 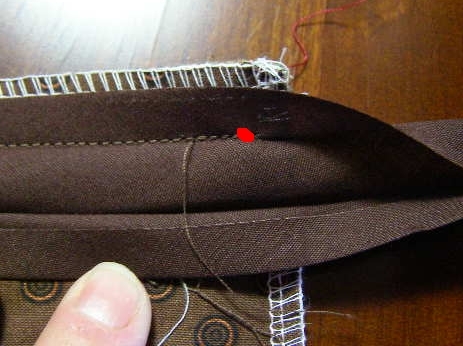 A straight seam sewn 1/4″ from the edge of the wide border is fine. Trim edges even with edge of wide border with a rotary cutter. My Stash also contains bias binding, seam tape, rick rack and every thing Wrights. 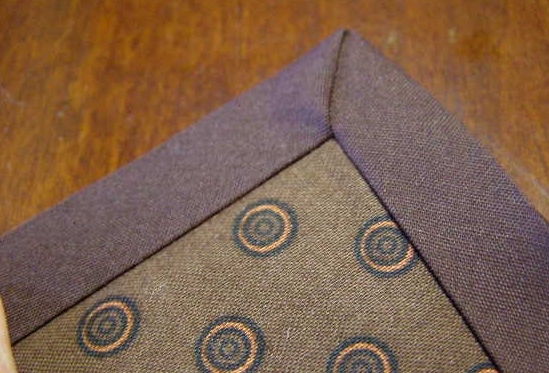 I found two packages of dark brown wide double fold bias binding – perfect color! Sewing the binding on to the straight sections is rather “straightforward”, but the corners can seem challenging. 3. End seam at red dot. 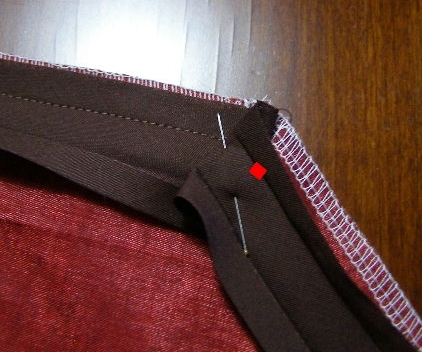 For the end points (90 degree angles) sew along stopping 3/8″ from the edge of the corner. 4. Fold bias binding straight up to form a 45 degree angle. Then fold down along green dotted line. 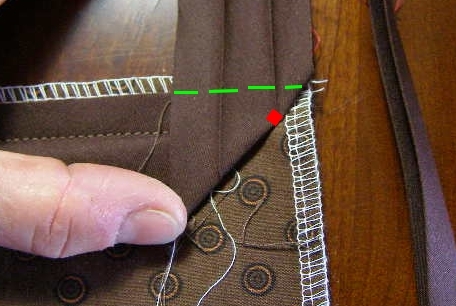 Fold the bias binding upwards to form a 45 degree angle as shown in Photo 4. 5. 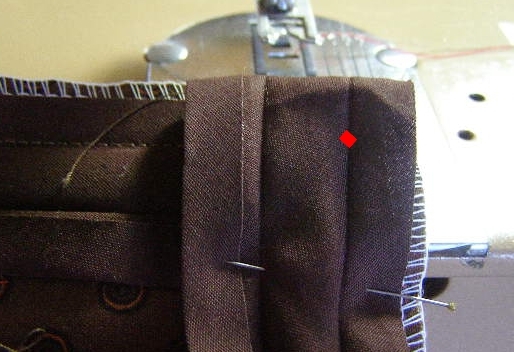 Start sewing a red dot to form a perfecdt 90 degree corner! Then fold bias binding down. Pin. Start sewing approx. 3/8″ from upper edge of fold. Finished corner looks sharp and precise! 7. End seam at red dot. The process is much the same for the 45 degree angle. 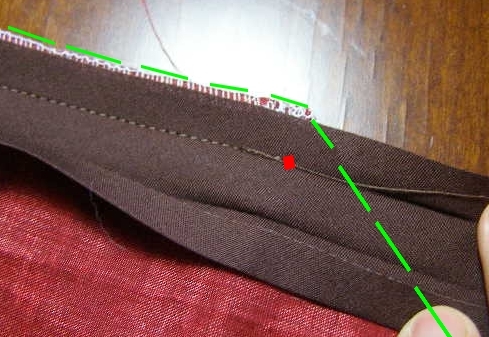 Sew to 3/8″ from the edge as shown in Photo 7. 8. Fold bias binding up and then down to form a small pleat. Pin. Sew from red dot. Fold bias binding up and then down to form a small pleat. Pin. Start sewing 3/8″ from upper edge. 9. Finished 45 degree angle bound corner! It might take a bit of sliding the pleat to the back or the front with a pin, but the end result will be very nice. Fold bias binding to back and stitch down! 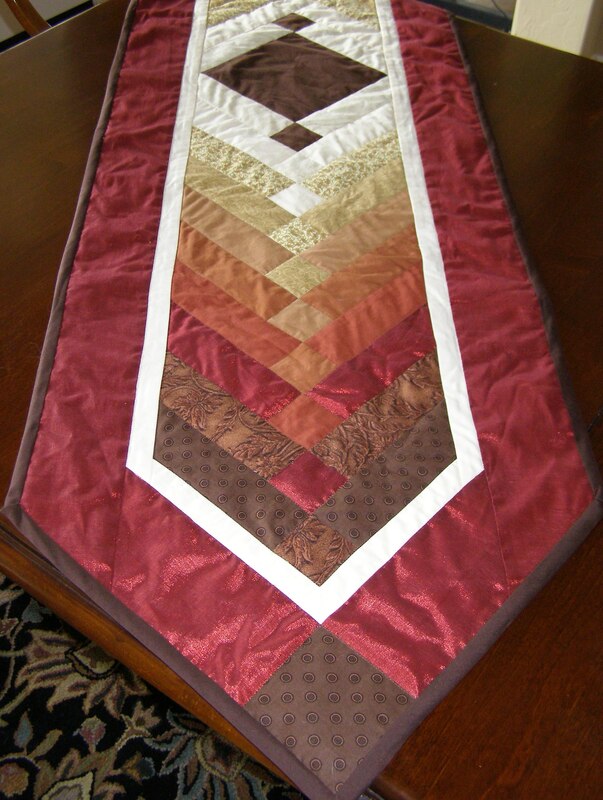 Your table runner is complete and will make a wonderful gift! Completed Destashification Table Runner - the shimmer of the wide border reflected nicely in this picture. 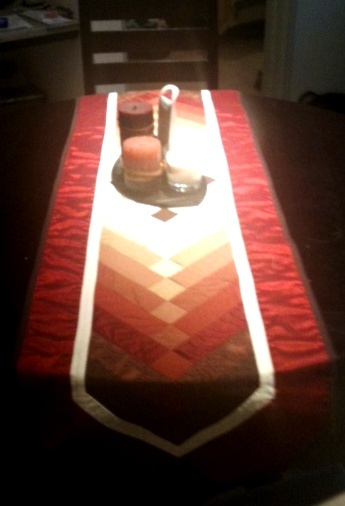 Two of the lighter fabrics also have gold highlights, making the table runner work for the Holidays or Everyday! This entry was posted in Destashification Braided Table Runner, Home Decor, Quilting, Sewing, Tutorial and tagged Sewing Gifts, Tu. Bookmark the permalink. Very nice tutorial! I’m a quilting newbie and this will be a good project to learn several new techniques. Thanks for sharing. Looks like a fun project. Thanks for the tutorial. Great tutorial! I am definitely going to make this table runner! Great tutorial. Very well thought out. You might consider putting all 3 layers together and quilt as you go. Just sew through all 3 layers and bind. HI, My daughter and her boyfriend bought us a beutiful lamp and when I put it on the dresser it looked like it needed a table runner. On my Ipad last night I was foreging for a free pattern and came across your runner. Love it. This morning I decided I would find it again and print it from the desktop. Well, was I peeved when I could not find it again, then hysterically happy when I finally did. Today I am going to start to make the Destashification runner. Will never take me an afternoon, more like a month, but I am going to do it and then let you know how it came out. The reason for the angled seams is when it is folded over the seam is distributed over an area and not all on top of itself. It really does help the seam “disappear”. I always use the angled method when attaching welt to an item or binding on a quilted item. I use this method at work when sewing bedding.